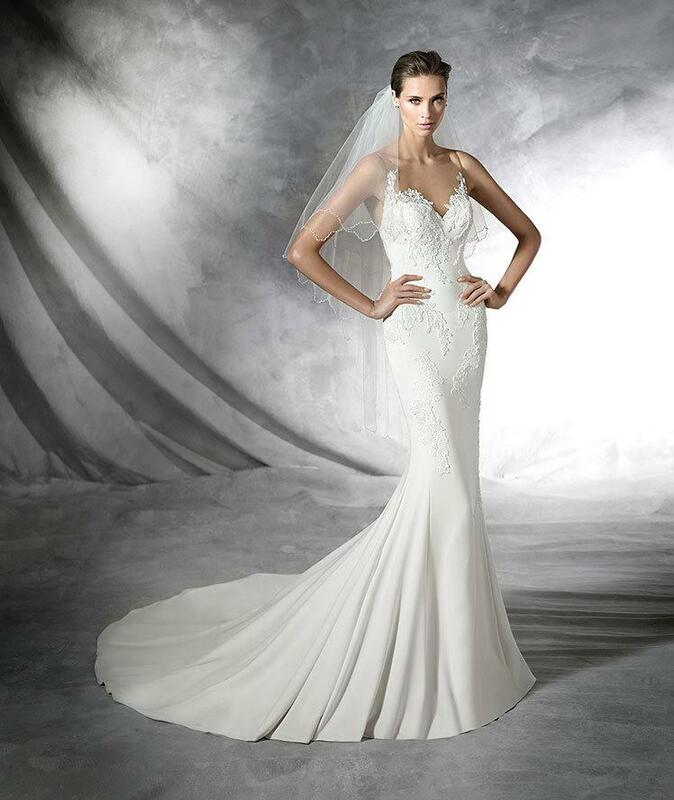 Trumpet or Mermaid shape/ Sheer illusion front/ Sheer illusion back/ Floor length Pronovias description: "Sensual crepe mermaid style wedding dress decorated with floral motifs in thread embroidery and with gemstone embroidery elements. The back has a sheer effect with captivating lace flowers." This dress lays beautifully and provides great coverage. The embroidery and applique are gorgeous and the sheer illusion fabric are practically invisible against skin. Measurements: Bust 32, Waist 26.5, Hips 34. The dress is labeled size 2 but fits like a 0. Perfect for a petite bride. Dress has been professionally cleaned. If you are in the Philadelphia area feel free to message me to arrange to try it on!